In the mix: 2 cups black beans, 1 cup oats, 1 cup carrots, small onion, 2 cloves garlic, 1/4 cup cabbage, 1 tomato, spices (s&p, cayenne, smoked paprika). Blend in food processor, form into patties and cook in med skillet at medium heat 5 min. on each side. 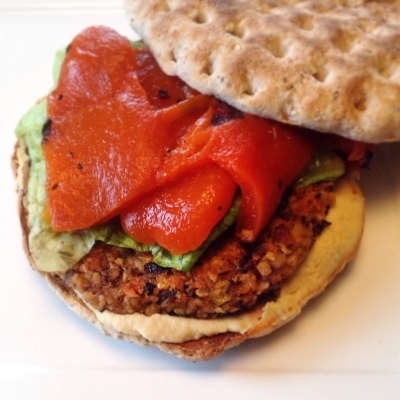 ðŸ’š Top with roasted red pepper, lettuce or avocado in a whole grain thin bun.